These images show views of Earth and the moon from NASA's Cassini probe around Saturn (left) and Messenger spacecraft at Mercury (right) from July 19, 2013. Cassini was 898 million miles (1.44 billion kilometers) away from Earth at the time, while Messenger was 61 million miles (98 million km) away. It's not often that some event comes along to really show humanity its true place in the universe, but two NASA spacecraft have just managed just that. I'm talking, of course, about the spectacular NASA photos of Earth as it appeared from Saturn —nearly 900 million miles away (1.4 billion kilometers) —as well as a photo of our planet as it appeared from Mercury, nearly 61 million miles (98 million km) distant. NASA took the photos Friday (July 19) using the Cassini spacecraft around Saturn and the Messenger spacecraft around Mercury as part of a global campaign to show the world how the solar system views our planet Earth. The space agency even worked to coordinate campaigns to involve space fans by having them wave at Saturn. The images, by far, are amazing. Earth and its moon stand out as bright pinpricks of light in Messenger's view from Mercury, while our planet is a pale, fuzzy dot nestled between Saturn's rings in the Cassini view. 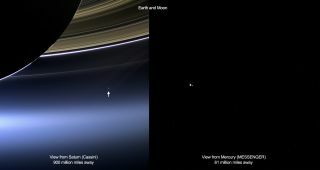 So what do you think of Cassini and Messenger's view of Earth from Saturn and Mercury? Has it given you a new sense of perspective? Or are they just more photos from old space probes retasked into a publicity stunt?